JONATHAN MABERRY is a New York Times best-selling and five-time Bram Stoker Award-winning author, anthology editor, comic book writer, magazine feature writer, playwright, content creator and writing teacher/lecturer. He was named one of the Todays Top Ten Horror Writers. His books have been sold to more than two-dozen countries. He writes in several genres. His young adult fiction includes ROT & RUIN (2011; was named in Booklists Ten Best Horror Novels for Young Adults, an American Library Association Top Pick, a Bram Stoker and Pennsylvania Keystone to Reading winner; winner of several state Teen Book Awards including the Cricket, Nutmeg and MASL; winner of the Cybils Award, the Eva Perry Mock Printz medal, Dead Letter Best Novel Award, and four Melinda Awards); DUST & DECAY (winner of the 2011 Bram Stoker Award; FLESH & BONE (winner of the Bram Stoker Award; 2012; and FIRE & ASH (August 2013). 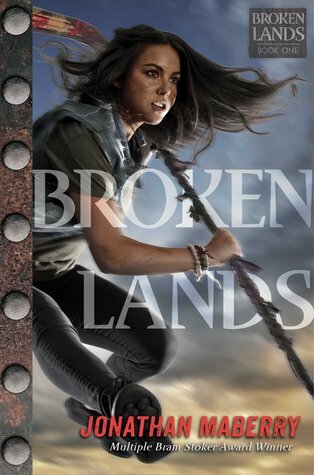 BROKEN LANDS, the first of a new spin-off series, debuts in 2018. His thrillers include The Joe Ledger Thrillers from St. Martins Griffin (PATIENT ZERO, 2009, winner of the Black Quill and a Bram Stoker Award finalist for Best Novel; EXTINCTION MACHINE, (2013; now in development for TV by SONY); PREDATOR ONE, and others. His first middle grade novel, THE NIGHTSIDERS BOOK 1: THE ORPHAN ARMY, was named one the 100 Best Books for Children 2015, with a sequel, VAULT OF SHADOWS debuting this year from Simon & Schuster. His standalone teen science fiction novel, MARS ONE, is in development for film by Zucker Productions and Lone Tree Entertainment. His upcoming standalone suspense novel, GLIMPSE, has gotten advance praise from Clive Barker, Scott Smith, James Rollins, Heather Graham and Charlaine Harris. His horror novels include The Pine Deep Trilogy from Pinnacle Books (GHOST ROAD BLUES, 2006, winner of the Bram Stoker Award for Best First Novel and named one of the 25 Best Horror Novels of the New Millennium; DEAD MANS SONG, 2007; and BAD MOON RISING, 2008), as well as DEAD OF NIGHT, 2011 (named one of the 25 Best Horror Novels of the New Millennium) and its sequel, FALL OF NIGHT, 2014. He also wrote the movie novelization, THE WOLFMAN, 2010, winner of the Scribe Award for Best Adaptation; and DEADLANDS: GHOSTWALKERS, an original novel inspired by the million-copy-selling role-playing game. He has also written the foreword to a new annotated edition of DRACULA from Writers Digest Books. Jonathan and colleague #1 NY Times bestseller Kami Garcia (Beautiful Creatures) each wrote an X-FILES ORIGINS novel for teens; with Kami focusing on Fox Mulder in AGENT OF CHAOS; and Jonathan telling the backstory of young Dana Scully in DEVILS ADVOCATE. He is also the editor of the dark fantasy anthology series, OUT OF TUNE (JournalStone), a series of THE X-FILES anthologies which launched in 2015; SCARY OUT THERE, an anthology of horror for teens; and the anthologies ALIENS: BUG HUNT, NIGHTS OF THE LIVING DEAD (with George Romero), JOE LEDGER UNSTOPPABLE (with Bryan Thomas Schmidt) and two volumes of mysteries: ALTERNATE SHERLOCKS and THE GAMES AFOOT (with Michael Ventrella).